Louis Jacobson visits a New York town that's on an economic roll. Angie Francalancia reports on a Florida suburb that's pulling out of its economic funk. Adam Regn Arvidson tells the story of a small town that redirected a federal bridge project to benefit its downtown. A modest investment in Wi-Fi put a rural community on the map. Justin Fritscher reports. David Versel explains how Biddeford and Saco, Maine, graduated from textiles to business diversity. They're getting leaner and greener, says Ruth Knack. Delays plague even the best public-private partnerships, writes Joe McElroy in Planning Practice. 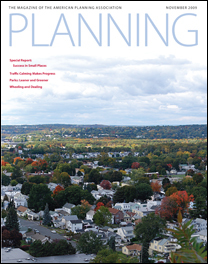 A new APA Planners Press book, by Reid Ewing and Steven Brown, reports on techniques used in U.S. and European cities. Is Houston on track to become the nation's greenest city? News reports, blogs, videos, etc. A monthly column on statistics in the news — compiled by APA's Research Department. This month: transportation. What you can do about wildfires.